Back disorders are regularly challenged by long-term disability insurance carriers. How can disability insurance attorneys Dell & Schaefer assist you? As disability attorneys, Dell & Schaefer have represented numerous long term disability claimants that have been unable to work as a result of suffering back pain. Disability Attorneys Dell & Schaefer have an expansive understanding of the significant restrictions and limitations that a person with back pain must live with on a daily basis. We have worked closely with top physicians in order to sufficiently satisfy a disability carrier’s threshold of evidence necessary to prove that a client is disabled by back pain. Not everyone suffering from back pain qualifies for long-term disability benefits, therefore the medical records of each client must be reviewed to determine the level of restrictions. We welcome the opportunity to discuss your long-term disability claim. You can contact us for a free initial consultation. Back pain is one of the most common causes of a person filing for long term disability insurance benefits. The disability insurance companies are notorious for denying disability benefit claims based on back complaints. The disability companies will generally deny a back claim on the basis that there is no objective evidence to support the claimant’s subjective complaints of pain. The reality is that medical studies have revealed that approximately 75% of the people that complain of back pain have unknown etiology. This means that 75% of the time doctors can not identify in an x-ray or MRI the exact cause of a person’s back pain. According to the disability insurance companies, a lack of objective findings means the claimant must be faking their back pain. After representing hundreds of people that have been disabled by back pain, our disability attorneys are aware of the exact information that must be provided in order to meet the disability insurance company’s threshold for proof of disability. While back claims are regularly challenged due to insufficient medical support there are numerous medical test available in order for a claimant to objectively support their disability claim. Beyond just the physical limitations caused by a back disorder it is essential to take into consideration the side effects of medication and the level of fatigue that a claimant experiences on a daily basis. We never present a disability claim based on how long you can sit or stand or based on your ability to lift up to 10 pounds. These factors are insignificant when it comes to proving that you are unable to work at least 4 hours every day of the week with reasonable continuity. What are causes of back pain? Back pain is a common complaint that affects most people from time to time. However, for some people back pain becomes a chronic disabling condition. Your back is an intricate structure composed of bones, muscles, ligaments, tendons and discs. Back pain can arise from problems with any of these components. Back pain most often occurs from strained muscles and ligaments due to improper heavy lifting or a sudden awkward movement. Back pain may also be caused by structural problems in the back such as; degenerative disc diseases, stenosis, facet arthrosis, osteophytes / bony spurs, neural foramina narrowing, bulging or herniated discs, sciatica arthritis, skeletal irregularities or osteoporosis. Back pain may also be caused by rare and serious conditions such as cauda equine syndrome, cancer in the spine or an infection in the spine. There are many causes of back pain as illustrated above, let’s take a look at the most common causes of back pain and their symptoms. Bulging disc – A bulging disc simply extends outside the space it should normally occupy. Usually a bulging disc does not cause significant pain or discomfort. Herniated disc – A herniated disc is also commonly called a slipped disk or a ruptured disk. Your spine is made up of bones (vertebrae) cushioned by small oval pads of cartilage or disks consisting of a tough outer layer (annulus) and a soft inner layer (nucleus). When a herniated disk occurs, a small portion of the nucleus pushes out through a tear in the annulus into the spinal canal. This can irritate a nerve and result in pain, numbness or weakness in your back as well as your leg or arm. Common symptoms that are associated with a herniated disc may include; sciatica (a radiating, aching pain accompanied by tingling and numbness that starts in your buttock and extends down the back or side of one leg), pain, numbness or weakness in your lower back and one leg, or in your neck, shoulder chest and arm, or lower back or leg pain that worsens when you sit, cough or sneeze. Degenerative disc disease – Degenerative disc disease is not actually a disease, rather it is a term used to describe the changes of the spine as you age. 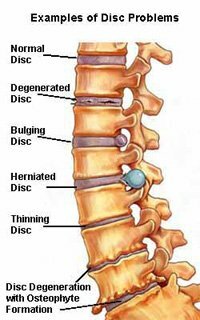 Degenerative disc disease involves the intervertebral discs. As you age, the discs can lose flexibility, elasticity, and shock absorbing characteristics. They also become thinner as they dehydrate. When all that happens, the discs change from a supple state that allows fluid movement to a stiff and rigid state that restricts your movement and causes pain. If you have chronic back or neck pain, you may have degenerative disc disease. People suffering from degenerative disc disease will suffer from chronic lower back pain with intermittent episodes of severe lower back pain, radiating hip, buttock and leg pain, numbness and tingling. Generally the pain does not go below the knees. Lumbar disc disease – Lumbar disc disease usually starts with a torsional (twisting) injury to the lower back, such as when a person rotates to put something on a shelf or swing a golf club. However, the pain is also frequently caused by simple wear and tear on the spine. Lumbar disc disease is fairly common, and it is estimated that at least 30% of people aged 30-50 years old will have some degree of disc space degeneration, although not all will experience pain or even receive a formal diagnosis. In fact, after a patient reaches 60, some level of disc degeneration is deemed to be a normal finding, not the exception. Most patients with lumbar disc disease will experience low-grade continuous pain that will occasionally flare for a few days or more. Pain symptoms can vary, but generally are: lower back pain that can radiate to the hips and legs. This pain is generally becomes worse when sitting and can be exacerbated by certain movements particularly bending, twisting or lifting. 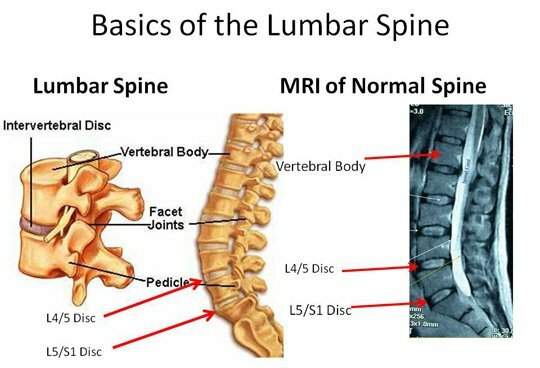 The low back pain associated with lumbar disc disease is usually generated from one or both of two sources: inflammation as the proteins in the disc space irritate the surrounding nerves and abnormal micro-motion stability when the outer rings of the disc are worn down and con no longer absorb stress on the spine effectively. Lumbar radiculopathy – Lumbar radiculopathy refers to pain in the lower extremities in a dermatomal pattern. A dermatome is a specific area in the lower extremity innervated by a specific lumbar nerve. This pain is caused by compression of the roots of the spinal nerves in the lumbar region of the spine. Most people describe radicular pain as a sharp or burning pain that shoots down the leg which is commonly referred to as sciatica. In more severe instances, sciatica can be accompanied by incontinence of the bladder and/or bowels. Spinal stenosis – Spinal stenosis is a narrowing of one or more areas in your spine, most often in your neck or lower back. This narrowing can put pressure on the spinal cord or spinal nerves at the level of compression. Depending on which nerves are affected, spinal stenosis can cause pain or numbness in your legs, back, neck, shoulders or arms, limb weakness lead to a lack of coordination, loss of sensation in your extremities and problems with bladder or bowel function. There are 38 opinions so far. Add your comment below. I need to speak with one of your lawyers concerning my problem with my back. I have never received anything other than short term disability, I never knew until a couple years ago that my papers where concealed by my adjuster from my doctor giving me my MMI rating. Now am having trouble seeing my doctor, my bills are not being paid, I travel over 100 miles round trip to see him and for the first time am being denied to be paid for travel. I have been told by my doctor that he can not get my insurance company to allow him to treat me he may consider releasing me. I truly need some help, I have not seen a doctor since 02/05/2013. I have failed back syndrome with all my documentation to back me up by my doctors and doctors that the insurance company have sent me to, and they all agree that I will never be able to work again. My L3 L4 and L5 discs have been damaged. My story is too long to tell all. I just hope and pray that someone will reply to my cry. Thank you very much. I am currently diagnosed with chronic back pain (more than 6 years of continuing treatments). When I joined my current company over 13 yrs ago, I purchased LTD insurance and I was not being treated for any medical conditions at least 6 months prior and more than a year following my employment commencement. My back was originally injured in 1985 while on active duty USAF. But, was initially rated at 0% disability at discharge. Through the past 6 or so years, the condition of my back has worsened to DDD with bulged and herniated discs resulting in significantly reduced ROM. Additionally, in Feb 2012 I was injured on the job while trying to protect my back from further injury. My left shoulder ended up with a torn labrum and a torn bicep tendon. The treatment of for that was a complete open surgery (Mumford repair). This case was filed under workman’s comp (Chubb). After about 18 months, I received a permanent impairment rating of 16% loss of use of upper extremities. My employer has now offered me a job in CA requiring 30% travel (more likely much higher as I live in NC). I am very concerned that I will not be able to handle this position longterm. I need some legal advice regarding filing for LTD and perhaps some guidance related to the WC case. Please feel free to contact our office with respect to the filing of the LTD claim. Please note that we do not handle worker’s compensation cases. Ok I am about 3 months in on a LTD claim but every month it’s something new I have to do just to get my LTD payment. I mean the agent will tell me one thing and turn around and say he didn’t say that in a later conversation, like I have been under LTD since March 15th I have only received 2 checks on it and they knocked my LTD payment down from $1170 to just $50 just because I haven’t talked to a woman about filling my SSI or whatever it’s called. I feel like they’re looking for every reason to terminate my claim. What do I need to do? Thanks. What you are experiencing is quite common. As a determination for disability benefits is made on a month to month basis the insurance company can require monthly updates/information. With respect to the offset for SSDI benefits- it is common that a policy would allow the carrier to offset your benefit by the estimated SSDI benefit, but the actual offset of same usually only occurs when you fail to apply after it is requested. I would suggest you apply for SSDI and notify the carrier in an attempt to get them to lift the offset. However, please note that if the offset is lifted and you do eventually receive SSDI benefits you will be responsible for any subsequent overpayment on account of receipt of same. I have a curve in my spine and a limp on my right leg. I fall maybe two or three times a month. I have scoliosis. What can you do for me? If you have a disability insurance policy through your employer or one that you purchased on your own we may be able to assisted you in securing benefits under same. I broke my ankle performing a routine task on my job. The company’s worker’s compensation seems to have been quite good and has paid for all doctor appointments and physical therapy. The doctor tells me the pain I still have in the ankle will probably not go away and I will likely develop arthritis in that joint. The pain medicine, which began with a back injury 13 years ago or so, and have had to increase since this break last year, is beginning to cause severe memory issues and great fatigue. I drive 80 miles round trip to work and have to frequently pull over to sleep either on the way to work or on the way home, or both, so I don’t wreck. Having my memory behave properly is crucial to my job – as is the ability to commute back and forth without fear of crashing. Without LTD insurance, is there anything I should be looking into? Without long term disability insurance your only option may be Social Security disability. However, the likelihood of receiving same based on your ankle may be limited. I have not worked in 7 months I have lymbar radicapathy, bilateral neural For animal stenosis, arthritis, about 4 building disc and chronic pain. I just reach MMI they are only blaming the radicapathy but if I get a settlement from worker comp I’ve filled out for SSDI and Longterm Disability how long after settlement do I have to wait to get approved because of the settlement from workman comp? You will need to consult with a SSDI attorney as to any questions you have. If you need assistance in finding one, please feel free to contact our office and we will certainly assist you in finding one. I have severe sciatica and have sufferd with it for years. I can’t sleep for more than 2 hours at a time. S.s. denied me because I can’t afford to see a doctor as I have not been able to work because the pain never goes away. I suffer every day with no medication. I have an xray on disk from 2008 from a chiropractor that proves how bad my back is but it doesnt seem to matter. The chiropractor that I saw asked how I could walk around everyday with the pain I was obviously in. It does not go away. It has only continued to get worse over the years. If I could see a doctor now, there’s no doubt that I would be considered disabled. Is there anything you can do to help me? If Social Security denied you then you will need to consult with a Social Security attorney. Please feel free to contact our office and we can assist you in finding one. A lump sum on a disability insurance policy? Are you currently covered under and on claim through any disability insurance policy? If so, what carrier? I have been diagnosed with Arachnoiditis which has appeared after several surgeries which included a fusion of L4 L5 / S1 along with an uncountable amount of epidural shots for recurring pain. 1 year ago I had a pain stimulator installed hoping it would help. The diagnosis for Arachnoiditis was made after my pain levels had become unbearable.The doctor has run several different test and had a mylogram performed. I was also sent for a second opinion with both of them agreeing on the diagnosis. The long term results is that my health will continue to decline along with having to increase pain melds to help get through the day. I am currently working a full time job but I see that I may be unable to keep the position due me having to drive about 70% of my time. The diagnosis has no cure and will result in declining health what are you thought on applying while I can get work SDI and LTDI. Allen, if your doctors are willing to support your claim for benefits then you would have a viable claim to make. Please feel free to send us a copy of your policy to discuss your rights and options available under same. I am 55 years old HVAC mechanic who retired from my City job in 2015 because of my lower lumbar pain. have a acute lumbar strain I received in 2012 while getting out of a golf cart type vehicle at work which was always forcing me to bend and twist awkwardly to get in and out of it. This vehicle is not a normal work vehicle yet we were told to use it in spite of the fact that we could be in and out of the vehicle numerous times carrying tools, parts, climbing ladders and performing job duties. After being diagnosed and placed on light duty and receiving pain medication and treatment for a couple weeks I was sent back to full duty with exercise routines for my back. About two weeks later while at work experienced extreme weakness and pain in my lower right back and leg so severe it forced me to sit down. It eventually faded but resurfaced again while taking a leisurely nature walk. Now I’ve found that I cannot walk or stand more than 15 minutes without severe pain in my back and down my leg. I was in 2 car accidents within the last 2 years. I am experiecing low back pain with numbness and tingling going down my leg. I have had PT for some time, and it did not work my Othro is now asking me to consider injections. My concern is degenertive issues and how it will effect my every day living with this condition. I do not like working. Its hard for me to get out of bed daily. Robert, have you filed a claim for Worker’s Compensation prior to retiring? If the city provided disability insurance coverage, did you apply before retiring? JD, does your employer offer disability insurance coverage? If so, you could consider the possibility of filing for same. Please feel free to contact our office to discuss how we can assist you applying for benefits. I got hurt on my job in 2014. I had pain going from my lower back all the way through my hip and ending at my knee. I got put in pain management. I was misdiagnosed by my prior doctor because they didn’t run full tests, they thought it was a groin strain. My Dr sent me to pain management because he felt there was more going on they performed an emg on me. It turns out I have an L4 pinched nerve in my lumbar. My workers comp case is still going on but what else can I do or apply for ?. Do you think I should wait around for workers comp or hire an attorney? I have been going to physical therapy, my insurance is paying for everything not workers comp at the moment. I was hurt on an air force base. I don’t know what I should do. Tremeca, you will need to consult with a Worker’s Compensation attorney as we only handle claims under disability insurance policies. You can also inquire as to whether your employer provides disability insurance coverage you may be eligible for. I have had multiple issues with my lower back over the past 28 years, at times being out of work and about 4 years ago I was taking from work by ambulance to hospital because of sever back pain not allowing me to move. I have been treating this ongoing problem for years. I went back to work and again my back caused me to be out of work and this time was using my short term disability insurer. I was on STD for almost 6 months and became very depressed and felt I needed to go back to work. I found a job I felt I could handle and worked for about 18 months at this position as a contracted Biomedical field service engineer without benefits suffering at times in a lot of discomfort. When that job ended I found another position as a field Engineer with a great company. I am now on job about one year and am beginning to have a lot of discomfort doing my job and am worrying about my back going out yet again. I have been continuing to take pain meds as needed over the past 3 years which makes it possible to do my job and get my rest as needed . I do pay for LTD and STD insurance as I always have . But am now concerned that because I take my pain meds for an ongoing issue that my employer is unaware of, I need to know what precautions or actions I should or need to take to protect myself from the insurance company’s sharks that may want to throw the pre existing back injury at me , if I need to be placed out of work or found incapable of performing my position. Turning 50 this winter and thinking of my future as always. KA1967, the biggest concern is the pre-existing condition language that would be contained in your LTD Policy. Typically if you have been covered under the policy for 12 months (not working for the employer, but actually covered under the policy) then the pre-existing condition provision is waived. However, some policies contain different language. We would need to see a copy of the LTD Policy to know for sure. Please feel free to contact our office when you have a copy to discuss your options in greater detail. I have been in pain due to back pain for 5-6 years. getting epidurals and long list of treatments etc. Had a laminectomy 3 months back and now am back in pain. Surgeon suggested another epidural and wait for 3 months and if does not get better , will get another surgery. I am a on high dose narcotics but am back to work recently. My work involves taking care of patients with their meds and doses. It is very critical that I have full focus on my work because liabilities a very high. I am always sedated due to pain meds and worry that with pain and effects of narcotics I might make a mistake that might damaging to some one. This is my first week back to work and fatigue and pain is unbearable. How do I approach long term disability. AD, if you have a copy of your employer’s disability policy please feel free to contact us to review same and discuss your options in applying. I am suffering from lower back pain for years now (at least three). Three years ago I attempted to lift the back end of my riding lawn mower and instantly I was in IMMENSE debilatating pain. I had and xray done immediately and the radiologist called me the next day and said that the L2 was a compressed fracture and L3 and L4 were damaged. I have been on LTD now since Aug/13. But the insurance carrier is denying my permanent Ltd since they have not received objective clinical evidence. Procedures done in the last years (3) are: 1) total knee replacement with complications during surgery since the surgeon broke the tibia. There’s a rod with 8 screws holding it together. There’s still a lot of weakness in the thigh (4″ less muscle compared to right thigh). Surgeon indicated that his medical diagnosis is at least 18 mths of and is guarded. It’s only been a year. 2) xray, bone scan, mri, carpal tunnel tests all done and provided to ins. carrier. Not good enough. On the bone scan it indicates (compressed fracture of L2, L4, and l5, T10 is also damaged, carpal tunnel syndrome, sigificant wear and damage to L foot and feet extremities). It also indicated at the bottom that there are no new fractures. The ins. carrier hinged their decision on that statement. It’s like the rest of the page is blank. 3) Bone density xray, and I have the bone density of a 21yr old. Mri indicates degenerative disc and bulging, spinal stenosis amongst other things. Tests for carpal tunnel (since my hands go completely numb and there’s a horrible crushing pain as well) indicates severe carpal tunnel in both hands. Doctor indicates that they require surgery. Referred to a specialist and he indicated “patient off work waiting for surgery 3 -6 mths. My left knee is grinding inside like it used to and requires orthascopic surgery to remove scar tissue. In addition, Ive been diagnosed with PTSD, OCD, DID, and SEVERE MAJOR DEPRESSION with recrring suicidal ideation being acute. FIVE DOCTORS, Psycho therapist, ortho pedic surgeons for hands and knee, family doctor and physiologist, ALL indicate that I’m not to work and permanentlydisabled; but ins. Carrier feels that I can work. So before my group insurance coverage ends, I went to see an Occupational therapist for a two-day functionality assessment. During and at the end of both days, I was completely gripped with pain at 9 and 10 levels. That costs $1,200. Don’t have results yet but in a week I will. The pain was so bad that I couldn’t help but cry on both days. But I tried every test so that she could measure results. By the second day I had to lay on the floor, knees bent. I couldn’t move for a bit, then tried the sitting at a desk for sedentary work. The pain was so excruciating that I couldn’t concentrate on anything, crying in horrible pain. The pain was still there for at least another 16 hrs which is when I finally got home, took the morphine and today, I’m still at an 8 for pain. I’m really discouraged about all this. What do you think about this case. Please let me know. Diane Oh BTW 56yrs old. Diane, who is your insurance company? When was the formal denial of benefits and did you file any administrative appeal in response to same? Please contact our office to discuss your claim to determine how we may be able to assist you. Have you ever won an osteogenesis imperfecta type 1, disability case? In addition to bad balance, bone pain, especially in my legs and back. Facing heart surgery, to repair a valve and trying to focus on work, but it’s extremely difficult to focus. I have depression (undiagnosed at this time), constant fear, dizziness , loss of balance, hearing (ringing ears, constantly), sweating, shaking and digestive problems. Everything started falling apart, slowly over the last five years. I work as a part time bank teller, so my next question is, do I even earn enough, for this case to be worth your while? The bad news is, I live in New Jersey, and we all know what a banking/insurance playground this state is. Any advice? My first consultation with the heart surgeon is mid July. I am one transaction away from losing my home, healthcare and life. I cannot focus, in such a high paced, high security, multi tasking environment. If I slow down, as to not violate procedures, they get on me, for customer wait time, as “not managing my time”. Any advice? Thank you. 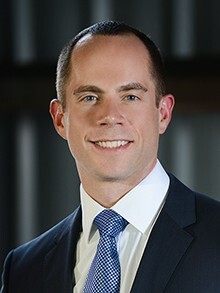 Terry, if you are considering filing a long term disability claim through an employer provided or privately purchased disability insurance policy, please feel free to contact our office to discuss. I have had back pain for several years, had epidural steroid injections – (even though I told the Dr. they didn’t help me). I then went to a Neuro Surgeon who diagnosed me with “Discitis Osteomyelitis” and I was started on a 2 month regime of antibiotics (which I am still doing). The pain is getting worse, some days I just cry because of the inability to move due to excruciating pain which now is going down my left leg. Is there anything that you could help me with? Robin, if you have a disability insurance policy we would be willing to review the policy to determine how we can assist you in securing benefits. Which disability company, in your professional opinion, is the best for paying out disability benefits? Lets say for a musculoskeletal issue like back or carpal tunnel. I am sure all of them give a lot of resistance, but which ones in your opinion will actually pay the claim? In other words, which insurance company stands out as the best for disability insurance? Thank you! Sam, in our experience, the individual disability carriers that have a track record for being the best would be: Berkshire (Guardian), Mass Mutual and Northwestern Mutual. With that being said a claim for disability insurance benefits is incredibly fact specific. Despite a company’s track record of claim approvals, an award of benefits will always be based on the information in the file. I have had back issues since 2006, I have DDD along with other problems that come along with that. I have worked for my company for about 4 years now, I recently was put on restrictions by my doctor and my company told me they could not provide light duty work for me and that I needed to file for STD which I did. I filled all the paper work out and got denied by Sedgwick even though my HR department said to file they still denied me. Now I filed for disiblity with Metlife which I believe is new York disability same paper work I just photocopied Sedgwick forms and used them and got approved till oct 2018. Sedgwick says that the there denial is cause (Medical does not support disability) is what is on the paper work. So now I am in a phone tag battle with them to see what is next steps. Dan, New York State Disability, or a MetLife private policy with your employer? Have you provided Sedgwick with the approval to notify them of the award/evidence of disability? I would also suggest you contact your HR department to let them know what is happening. We have published 184 articles about Back Disordersdisability cases. Here are the most recent ones.